Wrightwood, CA – October 28, 2011: Mountain High opened today at 10:00am making it the first resort to offer lift-serviced terrain in California for the 2011/12 season. The announcement came after just two nights of snowmaking and despite the limited notice, more than 100 guests turned out to participate. Due to a cold-air inversion, Mountain High was able to take advantage of chilly temperatures at the base of its East Resort and make snow on the beginner trail, First Tracks. There they laid three terrain features and let visitors jib to their hearts content. This opening was limited to current season pass holders creating even more value for the resort’s most loyal guests. Snowmaking has ceased for the moment but Mountain High plans to resume top-to-bottom snowmaking as soon as conditions permit, possibly as early as November 4th. For information regarding current and future operations guests should call 888-754-7878 or visit mthigh.com. Now through October 31st, adult anytime season passes to Mountain High are on sale for just $349. Regularly $699. Benefits include 10% Off non-sale retail items, $10 Off Adult ski or snowboard lessons, and the ability to track your days ridden, runs per day, vertical feet, and more. 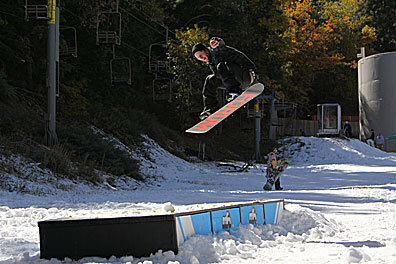 Avid skiers and snowboarders should call 888-754-7878 or log onto mthigh.com for more information.